Michael Aspel and the experts travel to Lake Bala, north Wales, where they see a pair of books inscribed to a local by Queen Victoria and an unusual collection of tie pins. Browse content similar to Bala. Check below for episodes and series from the same categories and more! romance and railways, shimmering lakes and wild, wild water. in this case Wales's largest natural lake, Llyn Tegid. which means "a warm heart of Wales". and in this area it's spoken by 90% of the population. Heave a brick from Bala High Street, and you'll find what looks like a prehistoric stone circle. But it's less than 40 years old, and marks the proclamation spot of the 1967 National Eisteddfod. when a Welsh poet whipped 12 pebbles from his pocket and placed them in a circle on the ground. Wales was at the forefront of the Nonconformist movement. Mighty chapels sprang up everywhere, and Bibles were brought in by the truckload. and was a pioneer of both the Sunday School movement and the Bible Society. RJ Lloyd Price, who built the distillery, also instigated the first ever sheepdog trial. and it was a Welsh Shepherd who emerged as top dog. but, whatever comes our way, I don't think our experts will see anything as rare as THIS. and it's found only in Llyn Tegid, and it's a protected species. Whether it's nice with chips - we'll never know! So, the time has come to dive in. -Have you some other pieces? -Where do you keep him? -Well, I keep it in the best room. -How long have you had him? -The name is Delphin Massier. but rather later than this. and, indeed, all Oriental things. -..something like that in this hollow in the back. It's made of a material called faience. Now, faience is a tin-glazed earthenware. and we know it in this country, and in Holland, as Delftware. -on which you can put these brilliant coloured glazes. -as it is in the case of his comb there. very decorative - exactly the sort of thing which is in fashion. Massier's got a good name. I could see this easily making £2,000 to £3,000 at auction. -..which is Patagonia, isn't it? -Chubut is a small place in Patagonia. -A small place in Patagonia? -What is the connection - 1865-1965? -Because the people went over. -On the teapot and the kettle. -and said it's a nice place to take Welsh people over. Tehuelche. Tehuelches are very good Indians. They show the Welsh people how to catch the animals and things like that. And he then funded it from Bala? -He used to live in Bala. -And you clearly lived out there, and you now live here? Michael Jones - these are commemorative plates. -This may be close to the time of his death. -He was born in 1822. -After the death, they make this one. -And you've got two types of tea here. but it's bitter. When you try it for the first time it's bitter. -No, this one, they use. -So, they would have served two types of tea? -..people who know who he is would be very keen to have such things. Yeah, because you can't get this one now, and not a lot of people got it. -They are, I think, very rare. -I can't imagine there'd be that much demand. -..and probably just under that for the plate. The mate teapot - about the same. -Not big values, but thank you for bringing these. I can tell from the quality of the binding they are something special. That is a wonderful green Morocco binding. They've probably got a binder's name in it somewhere. -Now, more than that - we've got a Victoria signature here. -And this one, as well? which was the family home then. They are "Leaves From The Journal Of Our Life In The Highlands"
and this is "More Leaves From The Journal". So, a sequel, as it were. -Now, what we've got there is a facsimile autograph. -And what we have over here is the real autograph. Now, that's a very fine inscription. It looks to me as if it's all been done by Queen Victoria. That in itself is uncommon. More often than not, the inscription would've been done by a secretary. Then it would have simply been signed by the Queen. and was very pleased to have visited him. -I love this, as well. -That was the house - Pale - where she stayed. and he died just before her visit. So he was the host to her, and that was dinner, which is rather good. -It does look rather good. "Her Majesty's Dinner, August 24th 1889." All in French, but, if I'm correct, she ended up with creme brulee. Well, these are unique. They are in remarkably good condition. What value can I put on them? We've got all the right points. We've got a quality binding. -I've got to do this. I can just imagine this being worn in the '20s. Have you ever worn it? How did you come to have it? in the auction in Dolgellau, and I just liked it. -It's such an unusual colour. -if you like, modernisation of woman. -Emancipation - they threw away their corsets. They were free. -They're not flowers, are they? It could have been made in England. I don't think it's French. It's difficult because there's no label. and very heavy - with all the beads. -It just lends itself to the dance. because I thought, "Hang on - it isn't quite the right length." -Now, the '20s were the short length. Then, suddenly, by the time we got to the 1930s, it was much longer. -And so someone has put that on so they can go on wearing it. -How do you keep it at home? and I keep it flat because to hang it would be... The weight of the beads would drag it. -But I'm hoping you can give me advice on that. Well, the advice is I think you're doing absolutely the right thing. -You want to protect it from moths. -Acid-free paper is the right thing. What did you pay for it? That's fantastic! Well, you've obviously got a good eye. -we are talking about somewhere between £500 and £800. -I didn't expect that much. -..compared to stocks and shares. I had a draught in my sitting room. and I thought, "That's pretty. OK, £5." I got it, and that's it. -You bought it as a draught excluder? -That's what I bought it as, originally. -22 years ago, I think. -I mean, 22 years ago, it wasn't an awful lot of money. -No, it was dirt cheap. Have you any idea about the origin? -No idea. I've done nothing. That's why I've come to see you. -That makes me feel wanted, actually. -The giveaway is the ladies because they're from the Far East. I think you've got to go as far as Japan. The faces are done in ivory. -It WAS your lucky day. It's all very well having a chipped jug, but this goes beyond the pale. It's a traveller's sample from the 1880s. It's such a wacky survivor from that period. Value - what do you reckon? I just find it interesting. I don't know the value. it's got to be worth between £70 and £100 - just to have one. I'd love it. it looks like you've been in battle with it. Where did it come from? I acquired it when my mother died. I inherited it. and you get this perfect reproduction of an original. It's made by Elkington's - a firm who were the great pioneers of this. It's actually signed and dated 1878. I think this is what they called The Milton Shield. Originally, it was all completely covered in electroplate. My mother cleaned it religiously. -of about £2,000 for insurance. That's lovely. Thank you very much. The clock in the middle here has a name, which I think is a local name. -So, this is quite a local piece, one would imagine? that really are, in some senses, characteristic of this area. -So, it comes out sideways. Oh, that really is quite secret. -Have you ever seen anything in it? -There never is, it seems to me. which is a wide-grained timber, this is lovely to feel. which is very much a characteristic of pieces of this area, too. but with a clock incorporated. -There do exist dressers WITH clocks, but very, very rarely. I think. to put a precise sale value on something like this. it's likely to go much higher than that. That's a portrait of myself 50-odd years ago. -I see. Now, the uniform is of...? -Is of Christ's Hospital School. -It's painted by Charles Spencelayh, as you obviously know. -It's extraordinary because he was almost 90 at this time. Tell me about when you were painted by him. I had to cycle about seven or eight miles, and then get changed into the uniform. I sat around most of the day and then cycled home. You say it almost as if it was a chore. Why was it commissioned? I take it you didn't want it to be done, but it was your parents. -and, as far as I understand, she would have settled the bill. I am taken by the stamp album. perhaps they weren't really, but it added some detail in the picture. -Were you a county lawn tennis player? -So, the paraphernalia there - it's a lot of artistic licence? Was the landscape a view from the window? -Well, he's obviously using all his skills in his inventions, and so on. -£10,000 or £12,000 would be a proper figure to put on it. between Suffolk and here, and I bought this. Now, what is it and what's it worth? Well, as YOU bought it, it must be worth something. and, um, I should think it's probably worth...£150? -Well, actually, I paid £18. Right? who probably paid £10 for it, who've got to make their profit on it. This question of values is one which confuses people the whole time. Which is the first one you go for? Probate is the lowest value you put on something. and that is the price that we USUALLY give on the Roadshow. that is an auction price. -Next one up is retail. and it's probably double upper estimate. but we're looking at roughly double. and that is to cover you against loss if it's stolen or broken. -What about jewellery? I know that's not your line, but the mark-up is colossal. effectively, a retail price - perhaps a little more for insurance. so his overheads are much greater. he has to charge more, and the insurance figure is much more. But my little pot... I paid £18 for it. we'd be talking about £300. in this country if you look hard enough. Do you wear a disguise when you go shopping? You can find all that information about valuations on our website. -most of it must be from my great-grandmother. This is the most modern piece. -That was probably made about 1920. -it's a very pretty ring. -It's a favourite piece of mine. -It would be of mine, too. -I'm not surprised it's a favourite. Looking at the other pieces, this is typically Edwardian. It's a nice twist pattern gold necklet. It's set with half pearls and a full pearl in the centre. -if you put all full ones in this setting, you'd knock them off. -It also doubles up on the price you'd pay for it. -This, of course, fits on the bottom. -if you went to buy it. Well, that name is my great-grandmother's maiden name. -Um, but I know so little about it. I've asked my mother - she doesn't know anything about them, either. -There are obviously three children. This is a mourning brooch. -Three children died - 10, 5 and 3. You know nothing about that? It's not in very good condition on the front. -but it's unusual to get four members of the family. -I mean, as a mourning brooch, the thing itself is quite badly damaged on the enamelling. -so you'd be looking in the region of, what, £400 to £600 for that. -You've some insurance to pay, I'm afraid. -You know full well this is a Belgian piece of glass. -We don't often get Belgian glass. -When you think of Belgian glass, you think of one factory. They made some great things. It's very misunderstood as a factory. -This is one of their better cameo vases. -but what about a signature? -There is a signature on it. -No, I don't know the name. because if you look at that, that is a V, S and L.
-It's a monogram used by the St Lambert factory. That makes me feel very useful. -the less chance you have of getting it back. It's lovely. I'm assuming you both like it? It is a beautiful piece of glass. If it was mine, quite honestly, I wouldn't part with anything less than £1,500 or £1,800 for it. -You'd better take it off me, because I'm loathe to pass it back. -It is a little treasure. -These are what I need for my future grandchildren. -That's unusual. Maybe it's honey. -Even his tail goes round, too. He's very busy. Then you've got this jack-in-the-box. -Let's see if he works. -Very frightening. Oh, there we are. -Quite frightening, if you're young. -Yes, it is - my children didn't like it very much at all. -It is frightening, but this is Chinese. but the star is... Shall we see what he does? -Now, this is actually a German make. but they started after the war making these sort of toys, so this is probably around 1950. Starting from him, he's probably worth about £40 to £60 at auction. -This one a bit less. You want two people in an auction wanting him - I would say we are talking of about £150. Oh, right, yes. That's a lot, yes. my mother-in-law sent this to a jumble sale here in Bala. -couldn't persuade his mother to withdraw them, so he bought them for sixpence. -Which was more money in those days, of course. -It's still not enough money I'd suggest. -They've stayed here ever since. -They're Austrian or German terracotta. Well, they'd make at auction, they'd be very popular at auction. -I suspect they'd make between £300 and £400. -Two tickets - one is from Llanuwchllyn to Bala. The other's from Blaenau Ffestiniog to Bala. -I've got a pair, actually, of those - 107 and 108. -And this says, "One dog." The fare from Llanuwchllyn to Bala was three pence, which I think was very expensive in them days. -Still expensive. They're both tickets for dogs? -Both tickets for dogs, yes. -You collect this sort of material? -Yes. I wish I'd brought the whole lot! -I just love everything about it. -So where'd it come from? when we first came here about 15 years ago. -We saw it in the shop and I fell in love with the colour of it. Yes. It just called to me. -The thing itself, a chest on a low stand, obviously goes back to the 17th century. -But the style of this suggests a bit later. -possibly across into North Wales, as well. -Has this veneer lifted fractionally? It's not actually a veneer. -and this is actually inlaid into the solid panel, so this is walnut which is inlaid. You can see how thick the inlay is because there's a bit missing there. then the cross grain of the walnut, which has been applied in sections. -Exactly! It really brings the thing alive. -Yes, that's the thing that attracted me. -Obviously its feet were bigger. -Tell me about the feet - they look very quirky. -We never cut them off! -No, it was like that. -No, but we know they should have been more of a cabriole leg. -Stood about that high, probably. -Probably rotted away on concrete floors. That cabriole leg would date it in the 18th century, rather than the 17th century. -Would you say the handles were original? To me, they're a little too fancy, too open, but beautiful colour. Um, I think in the right sale, you're looking at £3,000 to £4,000. -We didn't pay that much for it. A fellow tie pin collector! -How did you start collecting? -My great grandfather collected them. He probably had a lot of them made up. the first tooth his only child, my grandfather, lost. -A nice idea to have it made into a tin pin. -It's lovely. It's mounted up in diamonds, too. This one here catches my eye. -..who was quite famous for this type of pin. -Do you know the significance of it? -Yes. And what about the FUL at the top? Any ideas? No? Obviously, with tie pins, lots of them are made up FOR people - the novelty ones particularly are. there's one, looks like a horse's bridle, is it? -It says "2 to 1" in the middle. -This one's a real gambler's one, as well. -That's very pretty, all enamelled. the cupid's bow and the "up". -There's also a significance here. -The screw and the U, yes. -The screw and the U. The one thing I envy you is, I've always wanted a skull. They're macabre, but I haven't got one - I do envy you. -There's, what, about 30 of them? -That's a reverse crystal intaglio. It's actually incised at the back. -It's a cabochon crystal, and into the back they've cut the anchor, then hand-painted it. Always very saleable. It's a wonderful collection. -It's got to be £5,000 or £6,000 worth, I'd think. -It belonged to my auntie, and she worked for Lord and Lady Fitzgerald in County Wexford, Ireland. -When she married, this was given to her as a wedding present. -It's like a chocolate boxy thing. -..so it's previous to that kind of chocolate boxy type of painting. -Nonetheless, it's the chocolate box of its time. -I think this picture is about time. I mean, she's dangling a watch. You can see that it's early evening and there's a bit of a sunset going on behind her, as well. Yes, yes. I can see that now. I think she's kind of playing with that watch, isn't she? I think it's reminding us about time. She's playing with this watch as if playing with time. It's a layer of meaning you may not have bothered to think about it, but it's lovely! -That's another way of looking at it. It's charming - she's looking directly at you. I think it's English - I don't think it's necessarily by an Irish artist. -It'd be nice if it was. -Yes, and it makes pictures valuable if they're by Irish artists. The other thing is, it's set in this oval. It's very concentrated - not much is going on around her. Totally. It's just her, isn't it? -It's like a very large miniature painting. -Like a cameo or a miniature. So, I set to thinking, maybe it's by Sir William Charles Ross. Now, he was a society painter, but in miniatures. He painted all the grand heads of Europe, including Prince Albert. and he had to look at a different way of painting to support himself. He started painting on a larger scale, producing this sort of thing. I was wondering if it was him. We've discussed it occasionally - probably something in the region of £500...at least, I would hope. Yes, yes. Well, um, such a pretty picture, isn't it? Well, add a nought and you're closer - and a bit. -It's probably about £5,000, £6,000. as this has everything they're looking for. No, it puzzles me, so can you tell me anything about it at all? I'm sorry. My husband would be able to tell you more. I know that when his family got it or inherited it, it caused a lot of fuss and excitement. -I'm so sorry, I don't know, but it's made by Frod...? they lasted throughout the 19th century and 20th century. -This particular one was made probably around 1895. But it is based very much on a chronometer. To get into it, you have to unscrew the front, like a chronometer, to set the hands. In this example, you set the hands from the back. There we have the most beautiful balance wheel I've ever seen on a clock. That is a work of art. It is a compensated balance made of brass and steel. It has a mixture of gold and platinum screws around the outer edge for perfect timing. as perfect as he could, so it really is the most magnificent clock. There we have - turn it round the other way - what's called the fusee. The barrel under here, the fusee for ironing out any uneven strengths of the spring of the clock. This would keep time within a few seconds a week. It's a week going clock. It should run for a week. -Yes, about four, five, six days. and it's having difficulty going, so actually it needs a bit of a clean, there's no doubt about that. -So if this was coming to auction, I think you're looking at some £3,500, £4,000 price. -You can imagine a bit more - quite a bit more - if you saw it for sale in a shop. -It really is the most beautiful clock. so we walked inside and watched the auction. So I said to my husband, "Ooh, I wouldn't mind that." made by, of course, Nantgarw in Wales, but decorated in London. -Probably by Robins and Randall. probably the work of Randall - and continued with more birds. The gilding is in first class condition. London gilding was the paramount quality of gilding at that time and the whole thing is gorgeous. The birds are just scrumptiously lovely, aren't they? -Which do you like best? -I like this one myself. I'm not sure what birds they are - do you know what bird that is? Sometimes it's... There's a mallard this side. We've got this one on Bala Lake! -Lord knows what it would fetch at auction. -Thank you. Thank you for your kind words. So what caught your eye today? The Majolica cockerel or the tie pins? You can be sure of seeing them again on our website. That's all from Bala on the shores of Llyn Tegid. Before we go home we've got time for a trip round the lake and a spot of white water rafting! On the other hand, perhaps a cup of tea and a nice cake. Until the next time, from North Wales, goodbye. 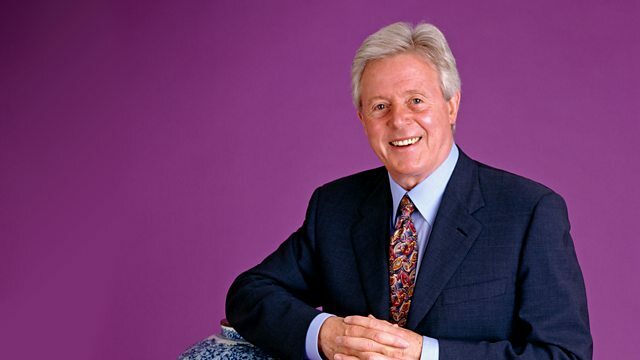 Michael Aspel presents the show in which members of the public are invited to bring along their antiques for examination. He and the experts travel to Lake Bala, in north Wales, where they see a pair of books inscribed to a local by Queen Victoria, an unusual collection of tie pins and a portrait by Charles Spencelayh. David Battie explains why a single item can have four different valuations, all of them still correct.